Married abroad? South Africa is a popular wedding destination, and it’s not hard to see why. Many of our beautiful wine estates offer wedding packages and our climate means that northern hemisphere couples have a much bigger “window” for a summer ceremony. Our foreign newlyweds will immediately be supplied with an Abridged Marriage Certificate, to be followed by an Unabridged Marriage Certificate when the marriage is registered with Home Affairs. The Unabridged Marriage Certificate is used to register the marriage back home. If you’re reading this you are probably residing in South Africa. You may or may not be a South African citizen, and/or you and your spouse were married abroad. How do you know if your marriage is recognised here in South Africa? What happens if things don’t work out? You may have heard this term and wondered what it means. Take the case of our visiting bride and groom above. Their Unabridged Marriage Certificate will be “apostilled” by Pretoria before being sent to them. This makes it legal in their home country and anywhere else in the world (almost). The principle of apostille is a pillar of the Hague Conference on International Private Law (HCCH). The HCCH has 83 member states (of which South Africa is one) – 82 countries plus the whole of the European Union, which is classified as one member state. The Apostille Convention (or Treaty), part of the HCCH, allows a document issued in one of the signatory countries to be certified for legal purposes in all the other signatory states. It is like notarisation here in South Africa, and is often applied to a document that has been notarised locally. As long as both countries involved are member states, there is no need for “legalisation”, which involves dual certification – by the originating country and the receiving country. If you get married abroad, you will need to show certain documents to the local authorities, usually your full birth certificate; valid 10-year passport with at least six months’ validity remaining; proof of any name changes (other than through marriage); and proof that any previous marriages are no longer valid – either the decree absolute in the case of divorce or the marriage and death certificates of the deceased spouse if one of you is widowed. When you get married you will be issued with a marriage certificate. Be sure to have it apostilled (this is likely to be done automatically for you as foreigners but play safe – double check). Then when you return home you simply register the marriage at Home Affairs using your apostilled marriage certificate and you will be issued with a South African marriage certificate. Although many popular wedding destinations are part of the HCCH, it’s worth noting that on the African continent only South Africa, Zambia, Burkina Faso, Morocco, Egypt and Mauritius are members. So if you are planning to get married in Zanzibar, for instance, you will need to have your marriage certificate legalised in both Tanzania and South Africa. You can find the full list of member states here. 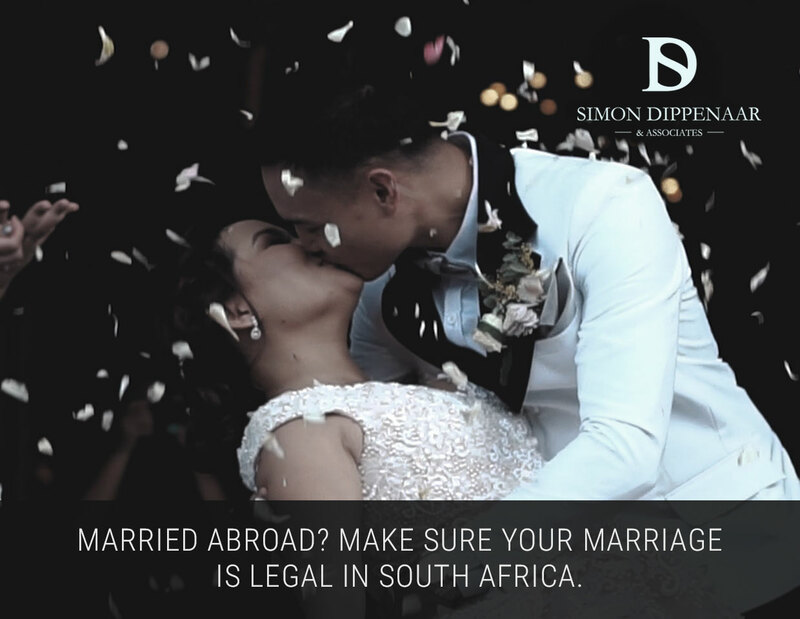 So whether you are a South African couple planning the wedding of your dreams abroad, or you met and married your spouse overseas and returned here, it’s a good idea to check the status of the country of marriage and make sure your documents are in order. You may save yourself a lot of heartache later. If you are not sure whether your foreign marriage certificate is legal in South Africa, contact one of our divorce attorneys on 086 099 5146 or 076 116 0623. We’ll investigate and help you put things right if there are any irregularities. Learn more about SD Law. divorcing a foreigner click here. divorcing a missing spouse click here. divorce and annulment click here. death when not married click here. This entry was posted in Married Abroad and tagged married abroad, south africa. Bookmark the permalink.